As students (and teachers and parents, too!) work on the challenges and share their thinking, we must remember to celebrate the struggle, reward risk taking and creativity, expect and respect (and inspect!) mistakes, all as a means of helping us learn more about mathematics and about ourselves as problem solvers. The YouTube user policies state that one must be at least 13 years old to create a YouTube account, which would be required to make a video response. Although this is a good guideline for participation in Collaborative Mathematics, the existence of an age restriction does not eliminate worries about students and online safety. If confidentiality is of concern, it should be noted that there is no set format for a response video. A response video could be created such that no students' faces are visible. For example, the camera might ''look over the shoulder'' of a student and only capture the paper on which she is writing while still allowing her to explain her solution. The student's voice could also be omitted, if video editing software is available to add subtitles. In any case, teachers are urged to get parental consent for any video uploading that may happen in conjunction with Collaborative Mathematics being used in the classroom. 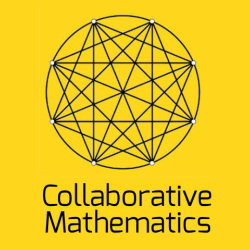 The challenges offered through Collaborative Mathematics aim to provide a structure for mathematical thinking, communication, and growth. We hope that they will be hard enough so as not to be a bore, but not so difficult as to overwhelm. Yet, the challenges may be quite hard for some students. They probably won't be the kinds of problems that can be solved in just a minute or two. Students may need to take some time (hours perhaps, maybe even days) to think about the problems. This kind of struggle and ''unfinished business'' might be hard for some students to tolerate, especially students who are usually quick to finish their math homework. But: struggling in mathematics is not a bad thing! We expect sore muscles when we exercise and try to improve at, say, basketball. Why would we expect mathematical growth to be painless? We must exert ourselves to grow. There is glory in the struggle! When possible, students should work with a team of problem solving peers. Our ideas are formed and refined as we communicate our thoughts to others and as we hear a diversity of ways of interpreting the same concepts. In my classroom I regularly have students work in groups. My students present their ideas to their classmates, and they are asked to listen critically and respond respectfully to the ideas of others. But this, too, can be hard for students. We must be vulnerable to admit that we do not know, and to let others see us struggle and fail as we try to learn. We must be patient with others who do not understand the things we understand (or think we understand!). There are many resources available online and in print about facilitating effective group work. The University of Waterloo Centre for Teaching Excellence offers some guidelines here.